We've written before about the deplorable public financing of stadium projects, and so we're excited to see the Miami Marlins' gleaming boondoggle face the SEC's federal scrutiny. Investigators have subpoenaed Marlins financial records and communications between Bud Selig and owner Jeffrey Loria, among many documents. But we're particularly tickled by this probe. The Marlins had argued that the team needed public help to shore up its finances. Financial documents published last year by the website Deadspin showed the team had been turning a profit. 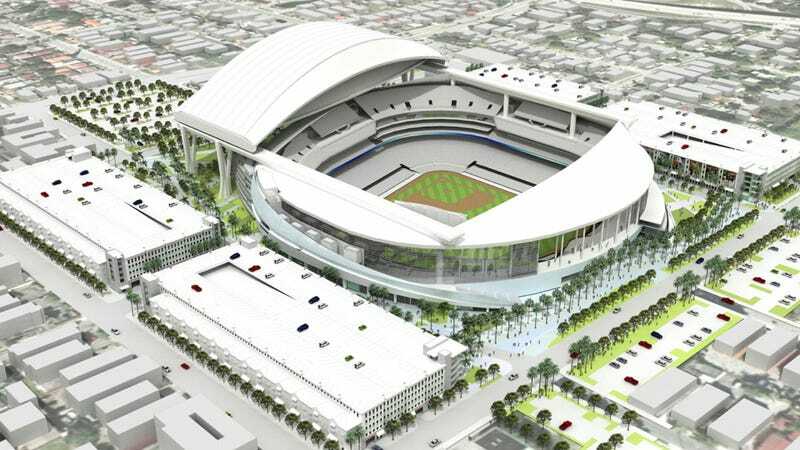 After the documents were published, Marlins president David Samson told the Palm Beach Post the team showed a hefty profit in certain years when it was conserving money for its ballpark project. The public funding deal, which was struck without a public referendum, came as South Florida faced mounting struggles with high unemployment and a cooling economy. In March, Miami-Dade County residents recalled mayor Carlos Alvarez—a move that was driven, in part, by his support for the ballpark plan. Norman Braman, a Miami car mogul who filed an unsuccessful lawsuit in 2008 to block the ballpark deal, wanted to force a public referendum. Mr. Braman also wanted Marlins owner Jeffrey Loria to prove the team needed public dollars by sharing the team's finances.